Our engineering consultants working both at our headquarter on the evolution of our products and in the field with you and other customers. 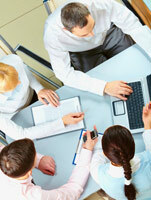 The implementation of a CMMS must be planned. DSDSystem’s experience guarantees your success and ensures that you will meet your deadlines. Our engineers can work with you to complete all the necessary IT installation including servers, databases, client installation and testing. We help with the identification, design and documentation of workflow best practices; all of which are critical to the deployment of a CMMS. DSDSystem’s consultants work closely with our customers to determine what equipment, spare parts and preventative maintenance routines must be integrated into the CMMS. DSDSystem’s engineers have developed interfaces between CMMS tools and the principal financial packages (such as SAP and PeopleSoft), property management (such as CTI and JD Edwards), planning management, control, and many others. Based on the results of the workflow and process study, DSDSystem will configure the CMMS so that it matches your requirements exactly. Training in both practice and theory is a key component of a successful CMMS deployment. It is essential that your team is prepared for the day to day use of the CMMS. No CMMS on the market today can offer you all the reports that you need for your business. With the help of SQL tools such as BO, Jasperreport, MS-Access, Actuate, SQR and Crystal Reports, DSDSYSTEM can create reports adapted to meet your every need.